Scandal is back! This episode felt like it had a slower pace than earlier episodes this season. I thought the show would come back with a bang, but it seems like we’re taking this whole “Quinn is dead” thing seriously. I’m sorry. I just...I can’t believe Quinn is dead yet. In my last recap, I said there’s absolutely no way Quinn is dead, but “Robin” does everything in its power to prove me wrong. There’s a somber, weird gun memorial. There’s a dead body with a hidden face wearing Quinn’s wedding dress. But there’s also a mystery baby and the fact that nothing with Rowan is ever as it seems. If Quinn really is dead, that would be a new trick for Scandal. Honestly, Quinn’s farewell montage was moving. Quinn’s “death” feels like the death of everything Scandal could’ve been before it was derailed by B613 and presidential campaigns. When Olivia handed OPA over to Quinn, it felt like a late reboot of the procedural aspects that made season one so enjoyable. Quinn’s “death” closes that chapter of Scandal for good. It looks like Mellie is using this as a chance to get Olivia out of the White House. I hope we get to see Mellie making some power moves next week. I love that Huck already has this figured out. I don’t think it’ll be long before Charlie figures it out either. David and Abby found a key piece of information. If Quinn is really gone, Olivia is going down. And you know what...I’m fine with that. Liv looked absolutely ridiculous in that white hat because she’s so far removed from Gladiator Liv. She has alienated and harmed everyone in her life. She has no one in her corner and she needs to face some consequences. When Cyrus went to jail, it shifted his character because he has done horrible things. 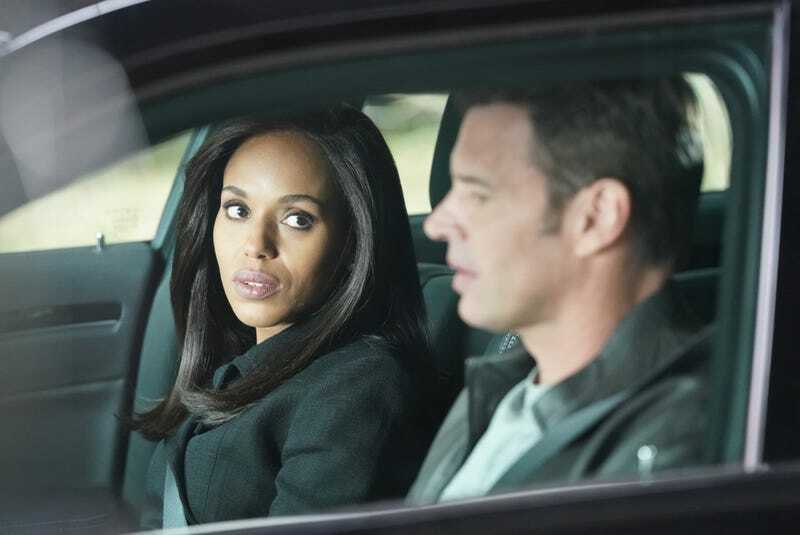 Liv needs her own opportunity for redemption. That “I HAVE AMAZING FRIENDS” line was hilarious. I could not take that scene seriously. Olivia has no one to blame but herself (as far as we know), but she’s yelling at Fitz? For once...I’m on Fitz’s side. Poor Cyrus. His perfect boyfriend broke up with him. I’m sad they’re over, but it’s totally fair. Cyrus is not a great guy and it’s fair to object to his record. My bet? Quinn walks in on Charlie and Rowan fighting.